Got another one for you guys. Part 2 in my series of finding the best fitting shirts for athletic men. In case you missed, check out part 1 where I review Twillory here. I spend too much time on my Instagram (@fitmanstyle_ btw) and of course I follow quite a few style enthusiasts and the usual happens, take a few pics plugging brands here and there. Hell, I do it too. One that consistently keeps popping up is The Tie Bar. Didn't pay it any mind until I kept seeing it over and over again (see what marketing does?!). So I said what the heck, I'd check it out they probably just sell tie bars as the name suggest and other accessories then WHAM! Shirts! So now I'm curious if these shirts would fit me and with a price point at $55 ($140 for 3) I couldn't pass the offer. I was about to order 3 online but I found out they have a location in Boston which is about an hr and a half east from where I live in Springfield MA. So I took a trip down there, met the store manager Micheal and got my 3 shirts, all with a touch of blue(really wanted a purple gingham but they didn't have it). So I got the shirts, tried them on, and here are my thoughts. I purchased a Blue Gingham Check, Blue Check and Chambray shirts. Always wanted a chambray shirt, think of it as the pretty cousin in the denim family. I've seen denim shirts before but Chambray looks a bit dressier than you average casual denim shirt. All shirts are 100% cotton and wrinkle free. When you go on their website I like how you can choose the type of shirt that best fits the occasion you want it for. A great way to differentiate which shirt is for work and which is for play. Of the two size options I went with a trim fit because I prefer my shirt cut close to my body. The trim fit felt a little more loose than slim fit which is great, my slim fits feel like the are painted on me. A little bit more options with the collar as opposed to Twillory, my previous shirt post. With the option of a button down, point and semi-spread collar you can choose the right collar for your facial structure. Those three option go well for the majority of face shapes so they definitely appeal to the average man. I opted for the semi spread, it works well with my oval face and it can host 2 out of 3 of my go to tie knots. I made a short clip on what those knots are, click here. Plastic collar stays with each shirt, which is standard. First Thing I look for in a split yoke in the back. The post I did on Deo Veritas and Twillory both emphasize the importance of a split yoke for gents with broad backs such as myself. 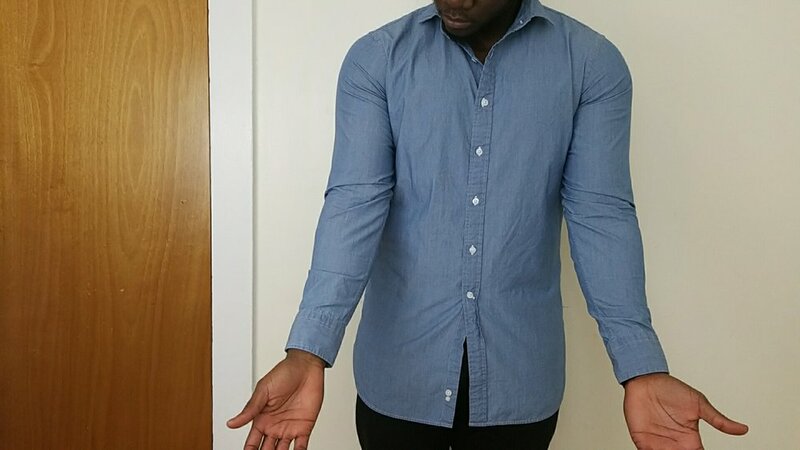 Even though I was disappointed that these Tie Bar shirts didn't have a split yoke, I was surprised that they still have room for my shoulders than my other other slim fit shirts. Hmmmm Trim Fit 1 - Slim Fit 0? I've been focusing on my chest lately in the gym so I was a little worried I may have some tightness in this area. Nope. Buttons ain't pulling in the front and quite frankly there's a little more room to grow them bad boys. They have all sleeve lengths, 32-33, 34-35, 36-37. I'm a 34-35 and it fits like all the other 34-35 I have. No complaints here. It allows me to show a little bit of cuff when I wear my sports coats. This was something different. The length on these shirts were unusually longer than your standard dress shirt. This can be good and bad. Good because I've noticed my shirts get tucked in longer and bad because, well, that muffin top look will have more fabric to it so just a heads up. For the shirts they sell at the price point they sell it for, not bad for the average man. I'll definitely be buying from them again, I don't know if they are looking to expand their shirt line but it would be cool to see other fabrics such as linen, flannel, cotton is one of those year round fabrics so you can't wrong with that. I've been rotating these three shirts for work and quite frankly, I need some more. Menswear has to be more that looking stylish right? Don’t get me wrong, everyone wants to look good in what they wear because if you look good you feel good and if you feel good you can live your life better. I believe however, that being stylish is a by product of function and….